BOSTON – The Common Core K-12 standards have gone from “inevitable” to “poisonous.” A new book adds to the woes of Common Core’s supporters by bringing together academic critiques from over a dozen scholars who provide an independent, comprehensive book-length treatment of this national standards initiative. 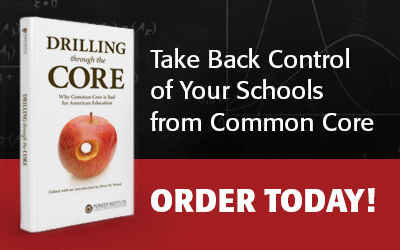 The book arrives at a moment when popular support for the Common Core is declining. Pioneer Institute’s timely new book, Drilling through the Core, puts into a single volume the results of five years of research. Common Core standards were developed by a group of Washington, D.C.-based education trade organizations and pushed on the states by the federal government through the Obama administration’s Race to the Top initiative. For parents, are the Common Core standards academically rigorous? For states, how much will it cost to implement? For Congress, are the Common Core standards and federally funded tests legal? Drilling through the Core examines Common Core’s dramatic reduction of classic literature; its failure to prepare students for college courses in science and math; and its flawed, “cold-reading” approach to historical documents. The book also refutes the claim that adoption of Common Core was “state-led” and “voluntary.” The federal government has illegally spent $360 million to fund two Common Core-aligned testing consortia. The introduction by Peter Wood to Drilling through the Core summarizes the debate, and serves as an appropriate prelude for the scholarly chapters by national experts on the academic, fiscal, and legal features of these controversial standards. Three chapters examine the English language standards and how they shape student learning generally, in the area of poetry and in the discipline of American history. Three additional chapters focus on the mathematics standards, comparing Common Core’s inferior academic quality to math standards from various high-standards states. Additionally, they examine whether these national standards prepare students to undertake college work in science, technology, engineering, and math. One chapter assesses whether the Common Core and the process by which states adopted the standards violate federal laws. A final chapter estimates that the transition to Common Core-aligned standards will cost nearly $16 billion. Pioneer Institute will launch the new book at a National Press Club event in Washington, D.C., on Monday, September 28th, at 9 a.m.